I’ve been through the Lenin Mausoleum and the Mao Mausoleum. 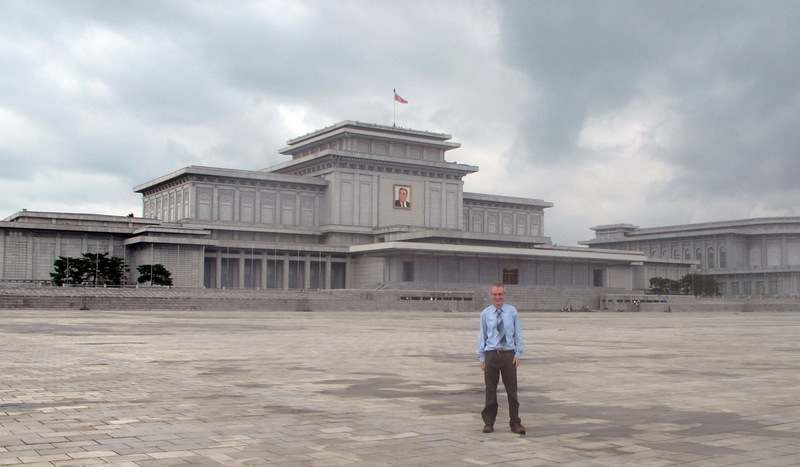 The Kim Il Sung Mausoleum is much, much, more intense than either. Definitely no loitering, chattering, or smirking. We were strongly encouraged by our guides to dress in our best clothes and to wear shirts and ties for our visit. The Mausoleum is a large sprawling building, formerly the Presidential Palace. Visitors are carefully screened before entering. Cameras and bags must be left behind. And of course we had surrendered our cells phones on entering North Korea. We were conveyed inwards through marble corridors on long moving walkways and escalators. As foreigners, we were given priority over patiently queuing North Koreans. The general mood was one of hushed respectful silence, and we tried to blend into that. Rumor has it that Chinese tour groups are no longer allowed to visit the Mausoleum, supposedly because they tended to be too noisy and thus “disrespectful”. As we neared the inner sanctum we passed through air blowers to blow away any dust we might bring with us. Then finally we entered the sanctuary and paraded around the preserved figure. As we had been instructed we bowed carefully at the sides and base. (But not at the head. Not at the head!) Kim Il Sung looks much less waxy and distinctly less vampiric than Lenin, but I’m afraid he does look rather Brezhnev-esq. We exited into a room full of the Great Leader’s honors and awards. We all relaxed slightly and admired the lengthy collection, including two Orders of Lenin, a standard Stalin WWII victory medal, and honors from most of the former USSR Republics and many other nations. The only US honor was a degree certificate from the little known Kensington University of California. 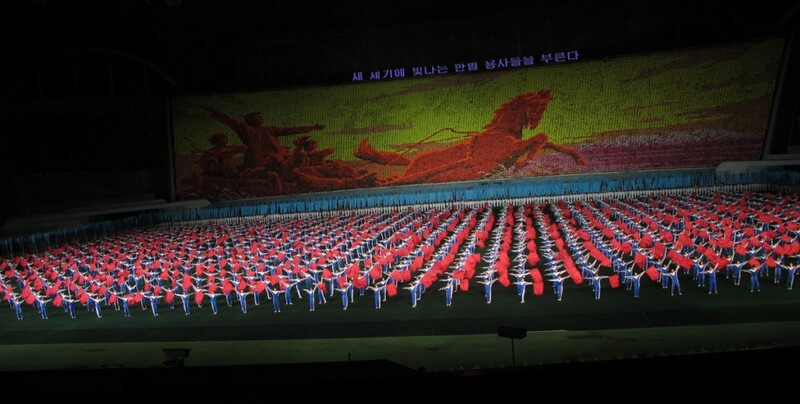 Some of the honors were posthumous, even as recent as 2007, presumably to recognize Kim Il Sung’s continuing role as the DPRK’s “Eternal President”. Breathing more easily, we now headed out. We were discreetly studying the inward bound North Koreans and they were similarly studying us. Sometimes covertly, sometimes fairly openly, occasionally defiantly staring past us. Mostly they seemed simply curious, occasionally friendly, in a very few cases hostile. 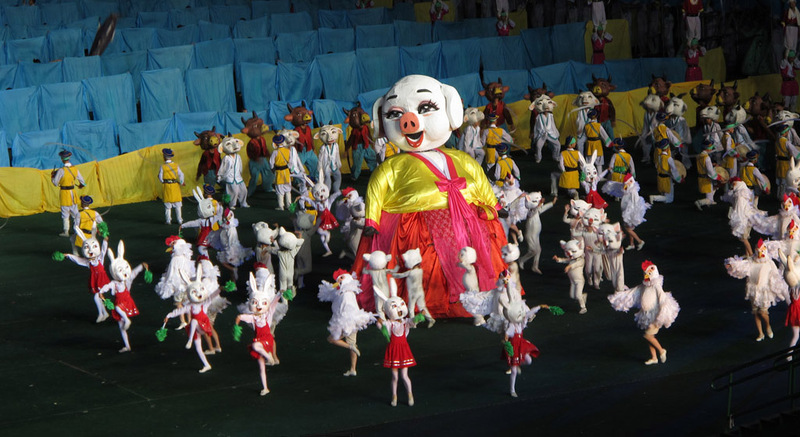 Some of these visitors might be making a once-in-a-lifetime visit to Pyongyang to see the Great Leader, so they were naturally curious at the unexpected bonus of exotic foreigners. I wonder what they made of us? I do rather fear that the regime makes use of visiting foreigners as further proof of the Leader’s greatness. See, even foreigners come from far away, neatly dressed, to bow at the Great Leader. Hmm. That isn’t quite what I had in mind.